For many reasons, I was excited when the Smithsonian Institution and the US Postal Service (USPS) announced the creation of the National Postal Museum in 1990. I’d been a supporter of the Smithsonian for years, and loved their monthly magazine. My father had been a clerk for the USPS for 25 years. More importantly, he was an avid collector of First Day Issue stamps, going back to 1939. We were both happy to see this museum launched. 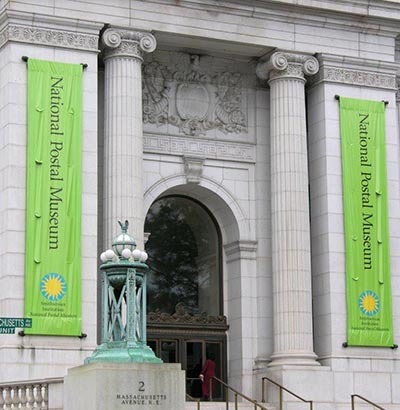 In 1993, the National Postal Museum opened their doors to the public. Fittingly, the museum is located in the historic City Post Office Building, which was the Washington, D.C. post office from 1914 through 1986. The museum’s exhibits celebrate philately (stamp collecting) and postal history. Over the last two decades, I’ve been able to visit several times, including as a guest for special USPS events. But mail is more than just stamps and the US Postal Service. The letters and packages that are delivered each day represent the work of the mailing industry – an industry that supports over 8.4 million jobs and generates over $1.3 trillion in annual sales revenue. An industry with a story that needs to be told. The National Postal Museum agrees. My good friend, Karen McCormick, is the liaison between the museum and the industry. This is good news, as Karen is someone who knows and understands our industry. In 1986, Karen founded a mailing company, Fulfillment Express, in Waltham, MA. For 28 years, Karen and her employees printed, stuffed, packed, labeled and metered millions of letters, brochures and packages for their clients. In 2014, Karen integrated her operations with The Field Companies Fulfillment Center Inc., also in Waltham. Karen gave back to the industry by serving on association boards. She’s been the president of the New England Direct Marketing Association and the local chapter of the Mailing and Fulfillment Services Association. Since 2001, I’ve served on the Greater Boston Postal Customer Council Executive Board with Karen, including the 4 years she was our Industry Co-Chair. She’s the right person for the job. Karen and the leadership of the National Postal Museum have been reaching out to different industry associations to garner their support for this project. So far, they’ve met with representatives from the Mailers’ Technical Advisory Committee, Volume Mailers Group, PostCom Board Parcel Shippers Association Board and the National Postal Policy Council. Over the next year, Karen will be contacting more associations to gather information and artifacts that represent the history of our industry. This May, they’ll also have a presence at the National Postal Forum in Anaheim, CA. This is great development for our industry. Too often, mail is marginalized by businesses and society. This project will help tell the important story of how the US Postal Service and the mailing industry are essential parts of our national economy. You can learn more about the National Postal Museum at their website, or tour the exhibits at 2 Massachusetts Ave., N.E., Washington, DC 20002.